Of course, an alternative is to create a wildcard version of the plugin; one that gives the numbers and one that gives the ratio(s). This will, however, dump the load on the munin-node. Creating graphs showing distribution by percentage is often required, while lots of the Munin plugins deal with occurrences and hits. For example, the numbers of hits and misses in a reverse proxy are indeed interesting to see the throughput, while the hits/misses ratio is interesting to see how efficient the caching is. By combining loaning data from other data sources, and massaging them with CDEF, Munin is able to create another view of existing graphs not currently graphing in percentage shares by itself, showing the data distributed by percentage. The munin.conf extract below is based on the fw_conntrack plugin, which has as much as 5 relevant data sources. The sections are commented below through line numbers. 01 - A standard definition for a node. 03 - Any other (required) information for defining a node, like address, has been omitted for readability. 05 - This virtual plugin should not be run by munin-update. 07 - Set min and max values for the graphs, and also include -r which tells RRD that the graph shall not exceed 100% even if the summarized values (because of rounding errors) do. 09-10 - The graph title and its vertical title. 12-23 - Use graph_order to loan data from other graphs, and to define not yet existing field names. Note that the first seven field names (11-17) loan data from corresponding graphs to be used later, while the rest (18-25) just need some dummy data for the definitions. 25-29 - Make sure Munin won’t try to graph the base data. 31 - Munin shouldn’t try to do anything funny with the total value either, as this value is only used internally when creating the graph. 32 - Here, the fieldname ‘total’ is defined as the sum of the 5 original data sources (in_*). We add the value 0.00001 to the value if all the original data sources should yield the value ‘0’, in which case Munin will crash and burn. 34 - Define the value for the first field name, derived as a percentage share of the total sum. 35 - The field name needs a label. 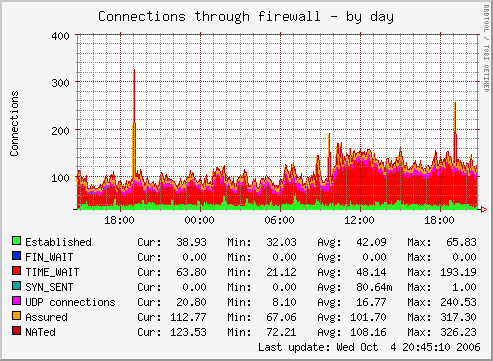 This should correspond to the original graph (in this case, fw_conntrack). 36 - Finally for this field name, define it as draw type AREA. 38-40 - Like the above, but use STACK instead. Repeat until all 5 data sources are covered. When the configuration is complete, Munin will be able to create percentage graphs from your already existing data, i.e. the new graph(s) should appear immediately. Note that the data sources assured and nated differ from the other data sources the fw_conntrack plugin monitors. Consequently they are excluded from the percentage graph.